The Virtru integration with AODocs adds a security layer with scalable and customizable encryption of the files stored in AODocs libraries. The Virtru encryption and access control comes on top of AODocs’ own security features. - Virtru can only encrypt non Google files. As Google files (Google Docs, Sheets, Slides) are created directly on the cloud, Virtru can’t encrypt them from a local device. - AODocs data such as custom properties or workflow status are not encrypted by Virtru. - You can only upload and encrypt one file at a time. 1. As a contributor, open a library in the AODocs interface. 2. If you are working in a Secured Folder library, press New and select Encrypt and upload a file. - Creating Google files from scratch. A Virtru pop-up appears. Select a file stored on your computer to upload, by drag and drop or or by browsing your file explorer. Note: You may have to allow pop-ups to be displayed in your browser and grant permissions to Virtru and AODocs. 3. If you are working in a Document Management library, press New. 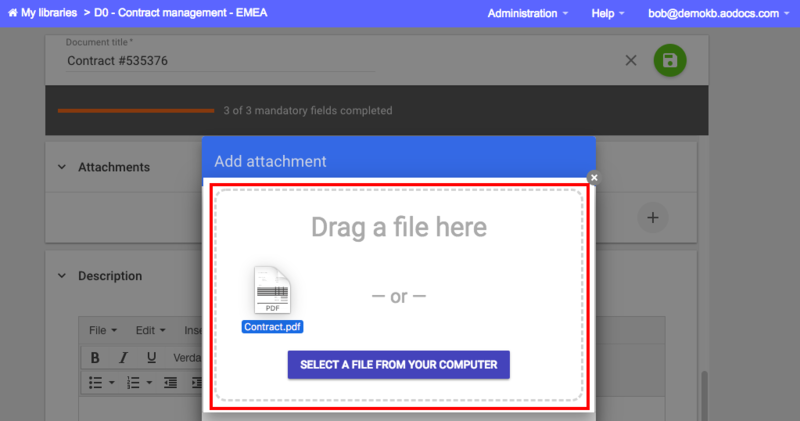 In the edit mode of your AODocs document, to add a new encrypted attachment, press the add attachment button. 4. In the Add attachment pop-up, select Upload using Virtru. 5. A Virtru pop-up appears. Select a file stored on your computer to upload, by drag and drop or or by browsing your file explorer. In Document Management libraries, administrators can force contributors to create only encrypted content. 4. Once uploaded, the files are encrypted through the Virtru uploader tool as TDF files. TDF files are then uploaded to AODocs. 5. At the same time, an encryption key is also created and partially stored in the Virtru Eaas Server. 1. 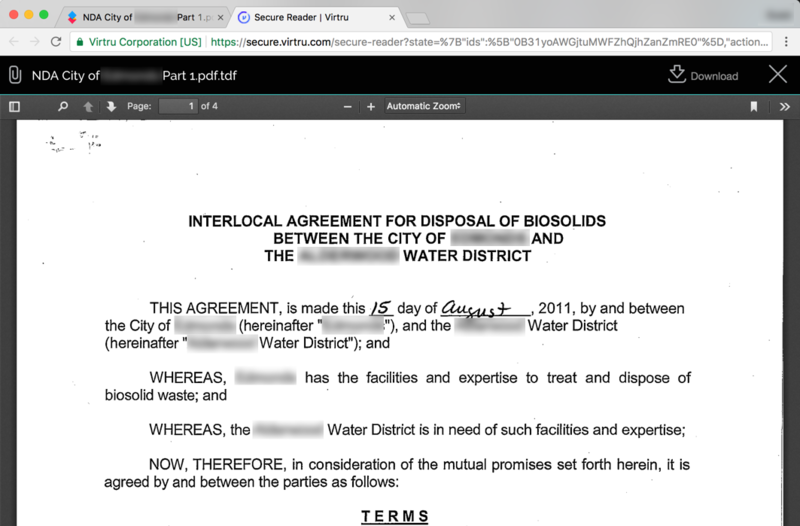 As a reader, access your library in the AODocs interface and open an AODocs document. 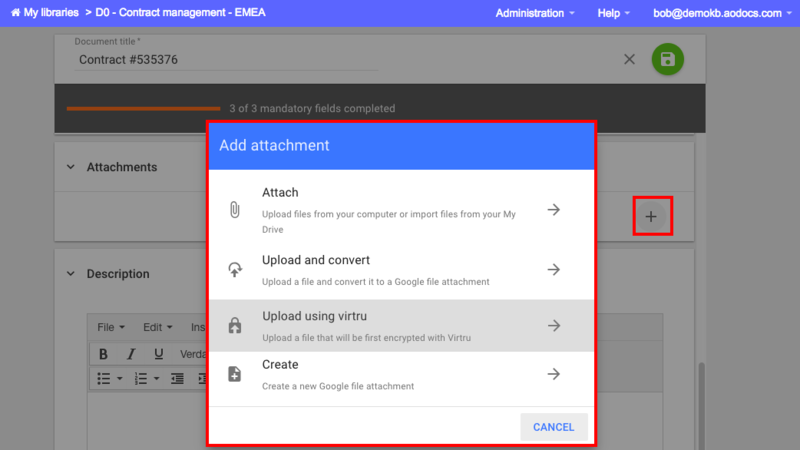 Note: If you are using a Secured Folder, you can view encrypted files in the Google Drive interface. 2. 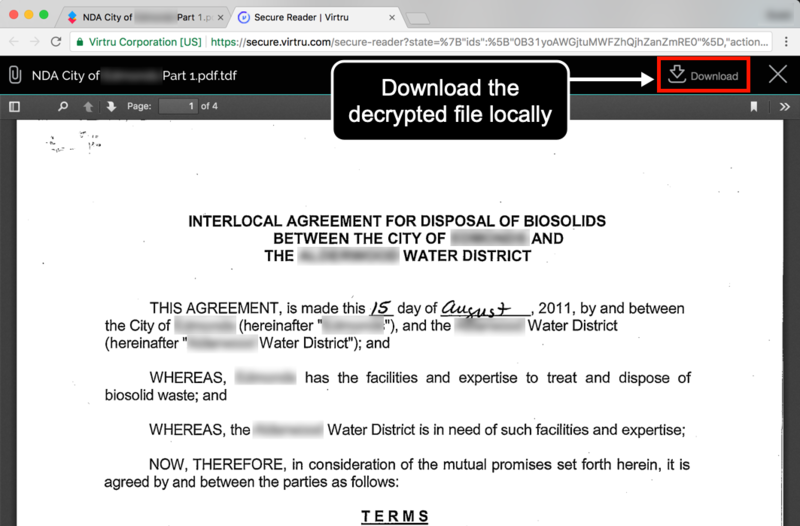 Select the encrypted file attached to the AODocs document in the sidebar to open the file in the Virtru secured reader. 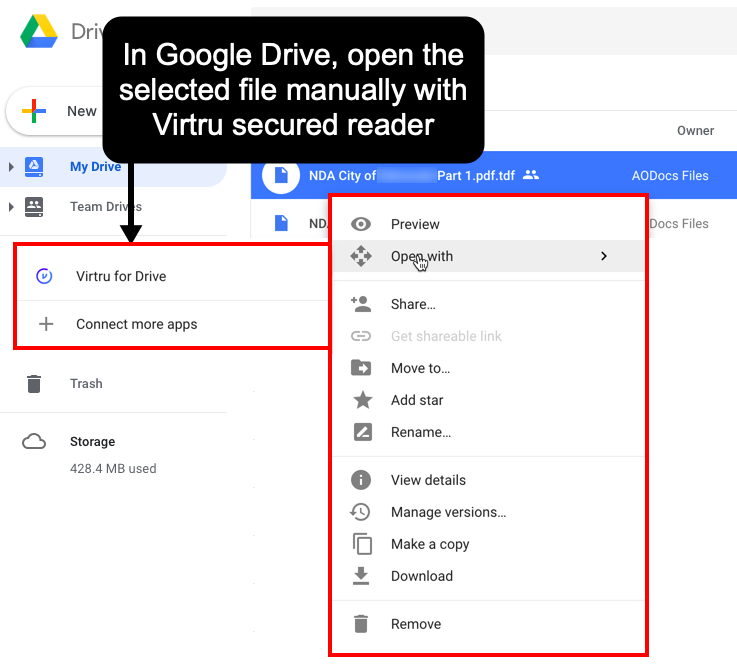 If you are using a Secured Folder and access your encrypted files from Google Drive, right-click the selected file and select Open with > Virtru for Drive. 3. Virtru downloads the encrypted data in your browser in the Virtru secured reader. Double-click the name of the file to decrypt the file locally in your browser. You can authenticate yourself through federated identity protocol providers (OAuth, SAML, Open ID) or use a time-locked one time password. Virtru checks that you have been given access to the encryption key of the document. 5. Once access to the decrypted file has been confirmed by Virtru, you can then view the decrypted file or download it locally. 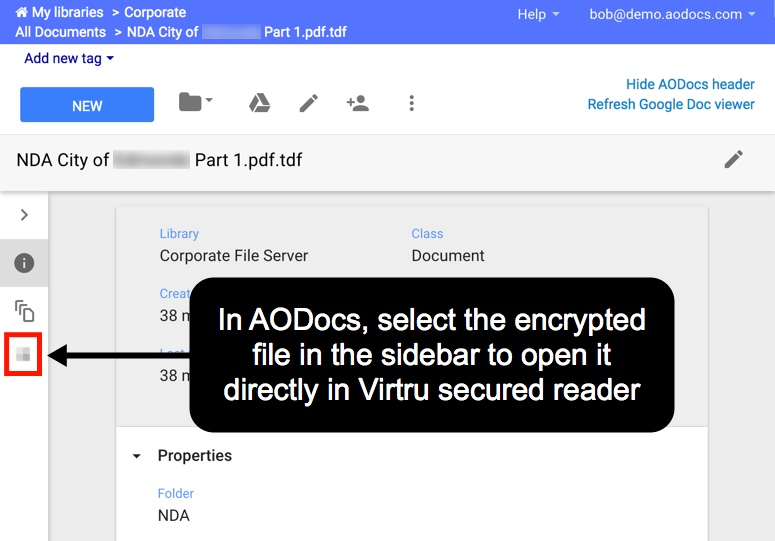 When Virtru is activated and once an encrypted file has been uploaded to AODocs, you won’t be able to modify its permissions from the AODocs interface. We advise library administrators to share their library content with Google Groups and manage permissions at the Google Group level. Note: If you want to share documents managed by AODocs, an AODocs super administrator must whitelist the external users. As the content owner, you can access the Virtru Eaas Server and manage their own encryption keys through a centralized dashboard. Only content owners and authorized parties can decrypt and read content. You can audit, revoke or alter access at any time in a matter of seconds. 1. From the Virtru secured reader, download the decrypted file. 2. Modify the content of the file locally. 3. Upload the updated file as a new file or as a new version of the file. Note: If you want to upload the updated file as a new version, you first need to encrypt the file locally with Virtru. 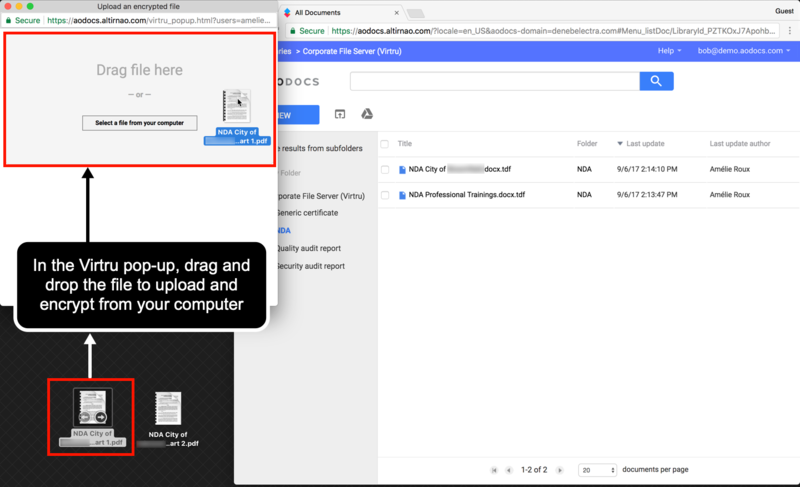 In Google Drive, the keyword search applies only on the file name and the system properties, such as the creation date and file owner. As the stored file is encrypted, the search doesn't apply to the content of this file. In AODocs, administrators can improve the search engine by applying custom properties or workflows.